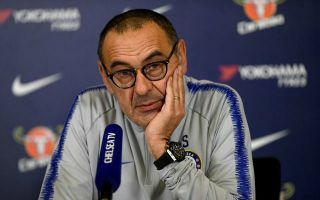 Chelsea face Tottenham in the first leg of their League Cup semi-final clash on Tuesday night, but Maurizio Sarri has conceded he has injury concerns. The Blues advanced to the fourth round of the FA Cup this past weekend, but now switch their focus to the other domestic cup on offer this season. However, they could be short of options as Sarri revealed in his press conference on Monday that Pedro, Willian and Olivier Giroud remain doubts for the clash with Spurs, as seen in the tweet below. That leaves the Italian tactician unable to rotate or rest others and with limited options, which could prove to be problematic against Tottenham in what promises to be a hard-fought clash between the two rivals. In turn, the likes of Eden Hazard, Alvaro Morata and Callum Hudson-Odoi could be in line to start again, and given what’s at stake, it would come as no surprise if the Chelsea boss goes with a strong line-up. Sarri added that Cesc Fabregas is also a doubt for the showdown with a calf issue, and so it remains to be seen whether or not that also forces him into drafting Jorginho back into the starting line-up after he was left on the bench against Nottingham Forest on Saturday. However, his main concern will be the potential absence of his attacking trio, as despite Giroud’s troubles in scoring goals consistently this season, he does offer a different option up front with his physicality and aerial threat.